In the iconic Times Square New York, Space150 specialist and brand of soft drinks have given a new dimension to outdoor digital advertising, this time with a system robot 3D created with 1,760 cubes Led and independent movement and fixed 245, which they perform spectacular choreographies according to the content that is displayed. 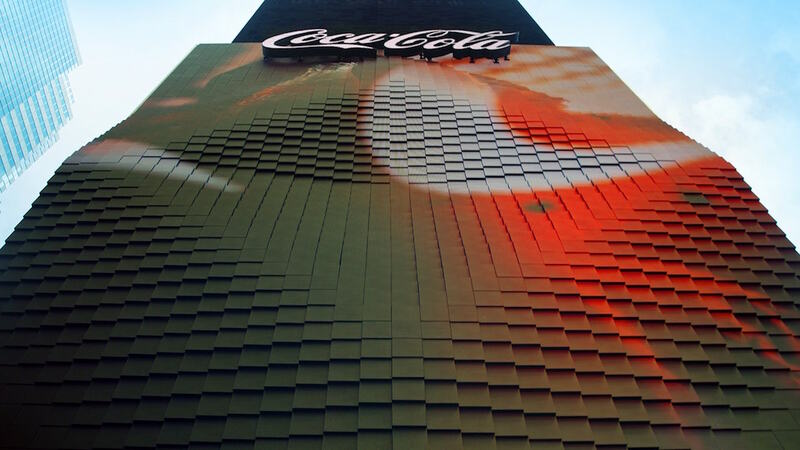 The first (OOH) advertising in 3D to date has had a no less shocking scenario, such as the New York Times Square, which travel around 300,000 people, witnesses of the amazing visual experience created by agency Space150specializing in digital design and engineering solutions. 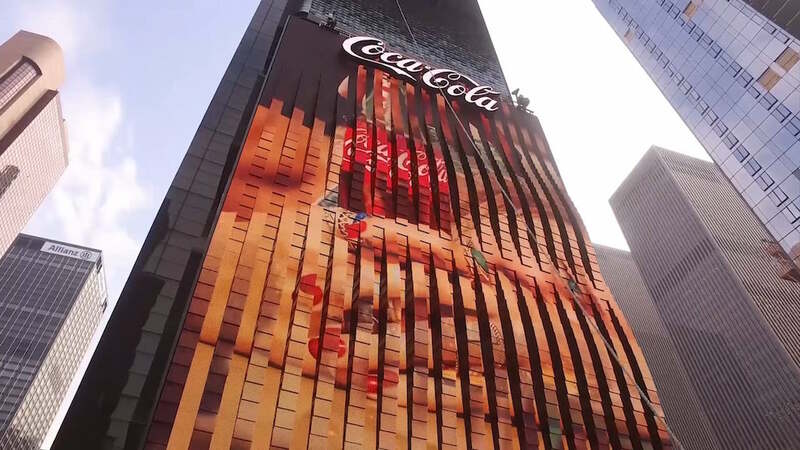 To create this innovative billboard 3D robotic for this multinational soft drinks used 1,760 Led panels with independent movement, along with 245 static Led panels that, depending on the content that is displayed, made striking choreography in Animated 3D that capture the attention of thousands of tourists and citizens who visit this hub of Manhattan every day. 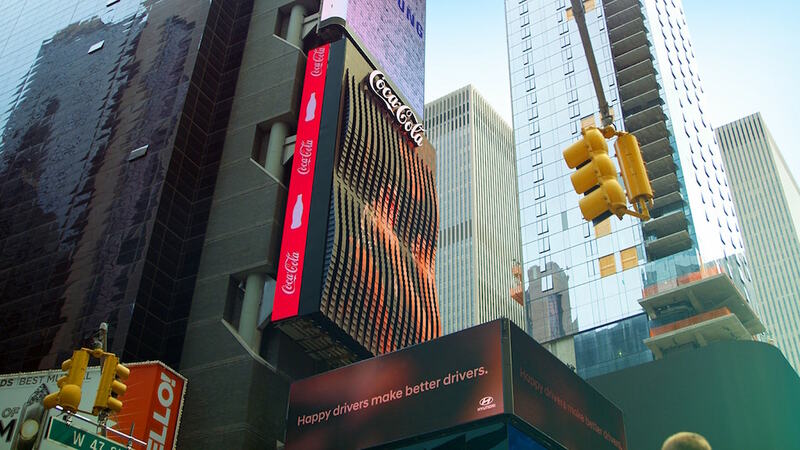 As noted Kim Gnatt, group director of Coca-Cola in North America business strategy, "from the beginning, our intention was to create a moment of relax and pause for our drink in the lively atmosphere of Times Square. Our patented 3D technology streamlines our iconic brands in a unique and differentiated manner with which we hope to attract the attention of people and do want to participate any longer". This revolutionary and dynamic Led giant display, 20, 7 × 12, 8 meters, has passed rigorous tests to withstand the difficult weather conditions in New York. Each cube Led high resolution is scheduled to extend and retract independently, simulating to audience approach and showing the range of drinks from the company this summer to fight the thirst and want to drink an ice-cold Coca-Cola Zero, Light, etc. At the forefront of innovation in outdoor advertising, Coca-Cola has renewed the success that took in 2004 on your screen in Times Square (and almost a hundred years) after it installed its first publicity in this square by applying its proprietary motion technology , in which design, manufacture and tests have worked during the last four years his team of r & d, engineering and marketing in collaboration with numerous partners. "Times Square is an iconic symbol of America and the epicenter of the outdoor advertising free, by what we wanted our new sign differed all what we had seen before - assures Miller-." "The campaign 'Share a cold Coca-Cola' this summer has to do with the union, so we saw the opportunity to use this valuable and visible space to celebrate with a broad audience the experience that Coca-Cola can offer".